It's a quiet morning in my lab—my undergraduate staff is holed up in the library, preparing for finals (as much as I miss school, I definitely don't miss that! ), and I've got the place to myself. What better way to while away the morning than with some podcasts? 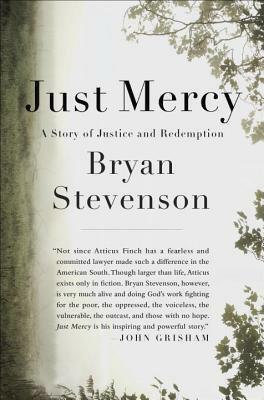 I remembered seeing Caroline's post about Just Mercy and how much she enjoyed Bryan Stevenson's NPR interview. If Terry Gross is involved, you don't have to tell me twice. The entire interview was interesting, but the part that gripped me the most was his opening anecdote. Stevenson, an African-American man, talks about being targeted by police in front of his own home. He was parked out front, listening to music and going through some of his paperwork for the next day, when an officer approached his car. Stevenson opened the door to tell him he lived there when the officer pulled his gun on him and said, "Move, and I'll blow your head off." Another officer approached and threw Stevenson on the back of his car, as neighbors gathered around, urging the police to interrogate Stevenson about some recent robberies in the neighborhood (Stevenson had recently moved there). They (illegally) searched his car, and after not finding anything incriminating, were forced to let him go. He asked the officers to apologize, and instead they said, "You should be lucky you got away. Next time we'll get you." This story is all too familiar. While Stevenson wasn't injured or killed, many (unarmed) black men are. It may seem especially timely in light of recent news, but it's nothing new. Or unique. In the interview, Stevenson says how his experience with law enforcement helped him—he knew how to interact with the officers without escalating the situation, by complying and speaking with them calmly. He laments how many people wouldn't know how to handle this, especially not children, a population Stevenson often works with as director of the Equal Justice Initiative. I picked up Just Mercy the last time I went to the library after watching it make a few TBRs during Nonfiction November. I read about twenty pages before setting it down, too involved with other books to let myself get in any deeper. I think, once I pick it up again, it's going to utterly engross me. Have you read Just Mercy? What did you think? Sounds like a timely read, though to be honest, I'm not sure I'd make it all the way through. Memoirs generally don't keep my interest. I hear you, they can definitely feel like a slog, especially when poorly done. I have high hopes for this one, though.